When the word “Apple” is tossed around, the first thing people think of is a vault full of money. Year after year, Apple releases new iterations of their product and people flock to the stores like a pilgrimage to Mecca, adding to the billions Apple has in reserve. I enjoy the many offerings that Apple provides, from the content I buy off iTunes to the iPhone I use socially to the Macbook Pro I create applications with at work. I love the cohesion of it all. Everything is simple and intuitive which makes it hard to imagine a time without it. The relationship has been quite monogamist thus far but now I feel the presence of a temptress at my side, and its name is Microsoft. Love it or loathe it, the fact is Microsoft is the oldest of all the smartphones manufactures and, as the saying goes, with age comes wisdom. We all had moments in our lives where we had a frustrating and dare I say agonizing ordeal with the Windows operating system. Yet with all the shortcomings in the many, MANY years I had to deal with the platform, I feel as though the paradigm is starting to shift and it is Microsoft, not Apple, that is becoming the innovation engine. Rather than making the same mistake Blackberry did in dismissing the inception of Apple’s smartphone as nothing more than a short-term fad, Microsoft slowly started to realize that the iPhone maker is more than a one-trick pony. Consumers follow the company religiously and arguably it was jealously that compelled the big-M to rethink – and ultimately redefine – itself. With its plethora of products and the release of Windows 10 just around the corner, for the first time ever the company has me eagerly anticipating what’s to come. To make everything connect seamlessly is a promise that Apple has made but one that Microsoft is in a better position to uphold. A bold statement indeed but a notion that can be proven true with the company’s unveiling of the Universal Windows Platform (UWP), allowing developers to create software applications that function natively on multiple devices. Further promoting the argument is the unification of the many technologies that the monolithic company owns. People can now make calls on the Xbox using the Skype application, create documents and presentations with Office on smartphones, and even give vocal commands to Cortana when using the new browser, Microsoft Edge. 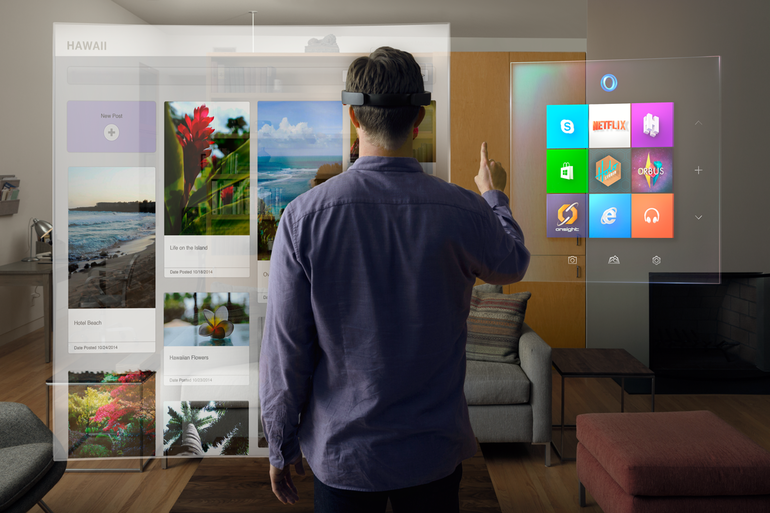 The real crown jewel is something I only briefly mentioned in my previous blog on augmented reality, but one that can really set it apart from all the big tech giants; Hololens. Though not the first in the AR headset market, it is by far the most opportunistic in terms of the functionality it will offer out of the box. Having been too young at the time, I was not fortunate enough to witness Apple rise like a phoenix from the ashes. Nevertheless I feel like I’m witnessing Microsoft begin anew, much like how Apple revitalized itself. Though reasons for the transformation differ between the two, the end goal is the same – to be the most adored tech company in the world. Granted, the metamorphosis is still deep in its infancy and the company suffers a less-than-stellar reputation that makes it all the more of an uphill climb. Regardless of the long-term outcome, I’m confident that Microsoft will inspire the creative minds of developers around the globe to create fantastic software applications, as it has for me.